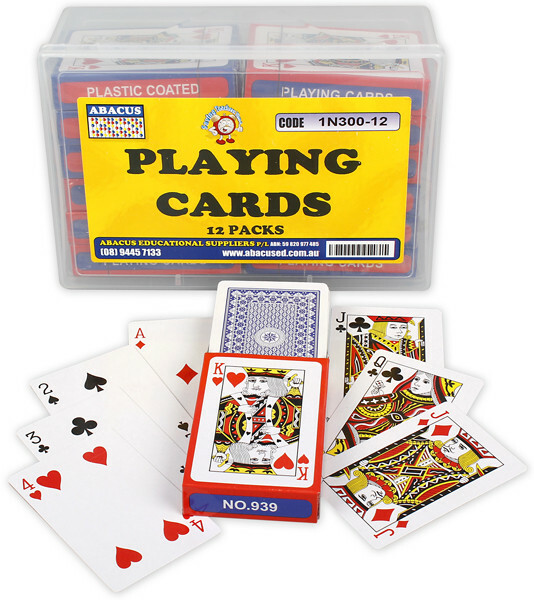 Playing cards are extremely versatile and are a great resource to reinforce key maths concepts like counting, addition, subtraction, multiplication and division, problem solving, place value, probability, sequencing, matching and more. Teaching maths with playing cards can add a lot of fun to any lesson. 12 packs of 52 playing cards in a container. Want some ideas for using playing cards to develop maths concepts? Have a look at Dr Paul Swan’s Card Capers book. "The Playing cards are invaluable in all of our classrooms. They are well packaged, long lasting and can be used for so many activities. Number recognition, adding, subtracting, subitizing etc. " Great and all the teachers are using them. "I'm the Maths coordinator for my school. I purchased sets of cards for each year level for Maths games. They've been great and all the teachers are using them."